Most people would associate stew with the words comfort food, but not me. Growing up Italian, stew didn't find its way onto our dinner table very often. And on those rare occasions that it did it was anything but comforting. To be fair, I'm sure it had more to do with the way my mother cooked it than anything else...but we should probably not go there. Years of cooking under my belt and I can calculate on both hands the stews I've made. Although, I want to see the comfort connection, something about stew just never seemed to catch my attention until recently. A fellow food writer and cookbook author, Hillary Davis, shares a recipe for a Nicoise stew in her cookbook Cuisine Nicoise. Combining the classic flavors of the South of France; wine, tomatoes, olives and oranges, this recipe has made a stew lover out of me. Marinate the beef in a large ziplock bag overnight in the refrigerator with 1 cup wine, two tablespoons olive oil, sugar, the minced garlic, and 4 strips orange rind. To make the daube, remove the meat the next day onto paper towels and pat very dry. Reserve the marinade. In a large heavy pot, heat 3 tablespoons olive oil and brown the pieces of meat in batches over medium high heat. After the meat is seared and browned on all sides, return it to the heavy pot. Add the reserved marinade, 3 tablespoons Cognac, carrots, onion, tomatoes, sliced garlic, tomato paste, 2 strips orange rind that you have chopped, 2 teaspoons thyme, and remaining 3 cups wine (or more) to cover the meat. Bring to a boil, then turn down to a simmer, partially covering the pot with a lid, and cook for at least 3 hours, until the meat is fork tender. Mix flour into 1/4 cup water until dissolved, then pour into the daube and stir well to incorporate. 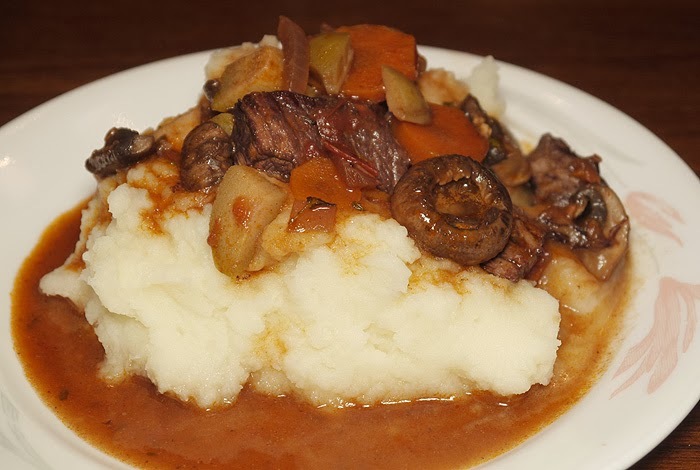 Add 1 tablespoon Cognac, olives, and mushrooms, and simmer another 5 to 10 minutes, stirring occasionally to incorporate the flour as it slightly thickens the sauce. Add salt and freshly ground black pepper to taste. Serve over egg noodles or mashed potatoes and sprinkle with remaining 2 teaspoons fresh thyme leaves. Lovely! Seems like we're both craving the flavors of Southern France this week! This looks so delicious over mashed potatoes...my family would love it! Thanks so much for sharing at Saturday Night Fever!